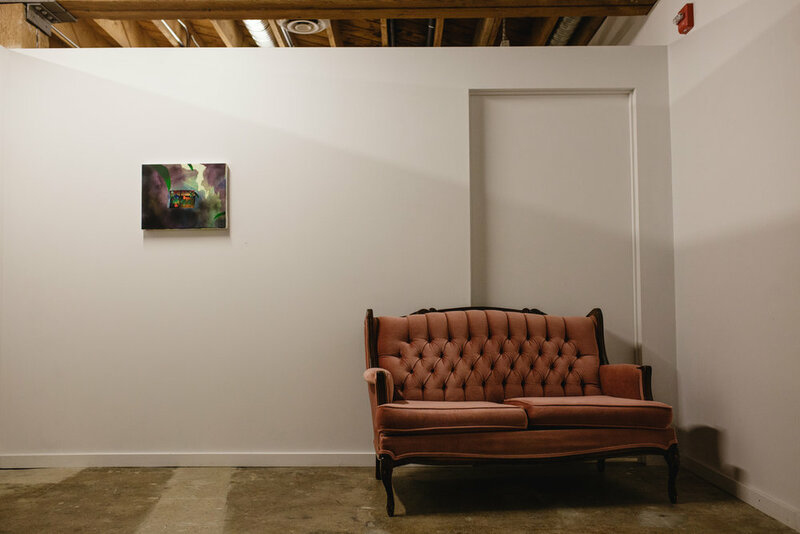 Lisa Kehler Art + Projects, the gallery space formerly housed in Forth's basement next to the bar, is in a period of transition. On June 30th, director Lisa Kehler hosted a small closing party, then proceeded to pack up and take down the very last show. After two years in the space, Lisa’s decided that the traditional gallery model just isn’t working for her and Winnipeg. Instead, LKAP will be throwing limited run pop-up shows that, according to Lisa, “are going to mark a shift in collaborating more with people, combining food, art, and music.” The first of these events is a Two Six art club reunion show with artists Ian August, Shaun Morin, Melanie Rocan, Cyrus Smith, Fred Thomas, and David Wityk at the Graffiti Gallery, cheekily titled Aiming Too High. It opens Thursday, August 17th. Lisa was kind enough to invite me down to document the last days spent packing up and closing down the gallery space, with help from her son Oliver. We sat down to chat more about LKAP’s evolution. FULL: So tell me a little more about what’s next for Lisa Kehler Art + Projects. Lisa Kehler: The gallery is going to continue on, just not as a traditional gallery space. It’s going to be more responsive to the market and what I’ve seen over the last few years of running LKAP, and Actual Gallery before that. I have realised that people seem to respond to a shorter timeline. You look at events like Third + Bird, Lucky Girl Pop Up, or RAW Almond, all have very limited timelines but have grown significant audiences. This is not necessarily the model of the gallery – to be a pop up – but to be more nomadic, more responsive to what I see as the next wave of galleries. A lot of the time and resources have been spent managing a physical space where I’m in charge of it’s upkeep, holding regular hours, big insurance costs and so on. I’d have these amazing, well-attended opening parties, and then nobody really came in afterwards. I deal a lot in markets outside of Winnipeg, so for me to be going to art fairs, I can’t have regular gallery hours, or I incur another cost of having to hire someone to look after the space. Changing the way I run LKAP is going to allow me to be a little bit more responsive and reactive to what I’ve seen happening here. Rather than doing the regular admin of having this space, I can focus more on the big picture; putting together proposals for corporations, trying to help other people start up corporate or personal collections, and travelling more. That’s the next focus of LKAP. FULL: You don’t see many small, independently-owned galleries in Winnipeg, so it seems smart that you’re putting in the work to adapt. LK: It’s been a real tough go. And I don’t think I really understood how tough it was going to be. I had a very specific outline of things I wanted to accomplish, with outreach to a very particular audience. I had people lined up to help, and then with all of the construction issues in the building, the first year was almost a write-off. The shows were fantastic, but the inability to maintain open hours resulted in very few opportunities for people to see the work. I had dinners lined up with people who had committed to hosting tables, bringing in an audience that I wasn’t familiar with, but construction interfered with that. And being the type of person that I am, had a couple run-ins with reviewers. Somebody gave a really negative and hurtful review to one of the artists, and people were coming in saying, “Woah, did you see that review?” It became this huge thing. I felt like as the person who hosted that show, it was my responsibility to contact the reviewer. I wrote them and expressed my concerns over the language that was used. That resulted in me never having another review in that paper. That was unfortunate. The artist was grateful that I stood up for him, so I feel good about that. I would do it the same again. I’ve never been that person who pretends to like you if I don’t. That may not be the best in business, but then people always know where I stand. After that happened, I feel like I really retreated from the local art community. I had serious anxiety, and felt like I didn‘t belong anymore. I didn’t have what so many other dealers in other places have – a community of other dealers. I found my focus shifted, and I began to really start to try to build stronger relationships outside of Winnipeg. Someone told me the other day that they believed I didn’t support the community here in Winnipeg because I never go out to openings. That shook me. Here I am representing more than twenty artists from Winnipeg, putting on shows, taking their work to international fairs, promoting them at every turn. It’s interesting to me what people consider support, and it’s been pretty eye-opening. It’s been challenging, and I think maybe things could have gone a little more smoothly. That first year was so intense. With all of the construction, I would have to cancel shows last minute. I feel like in that first year I did about three years worth of work. I’m not looking at it as a failure, just let’s go on to phase two now. I still think that there’s a way to put on shows in Winnipeg, to sell work, to slowly create a market here where people are excited to collect. FULL: You bring in art that I don’t see in a lot of other places. Consistently your shows are interesting and take risks. LK: Thank you. That’s something I’ve tried to focus on. A gallery is as much the vision of its director as it is the artist. That’s part of what takes so long; people need to grow to trust the person who’s running the gallery — their vision, that they’re seeking out the artists with a career ahead of them. I’m going to keep pushing to bring in artists who are more self-taught outsiders. I love art, and I love artists. I want to figure out a way to help artists I believe in to continue doing what they need to do. I put my heart and soul into this venture, and I’m ready to continue doing that, but in a different style. I am excited and optimistic. Aiming Too High opens at the Graffiti Gallery this Thursday, August 17th. Check out LKAP's website and follow along on Instagram to learn what's next.